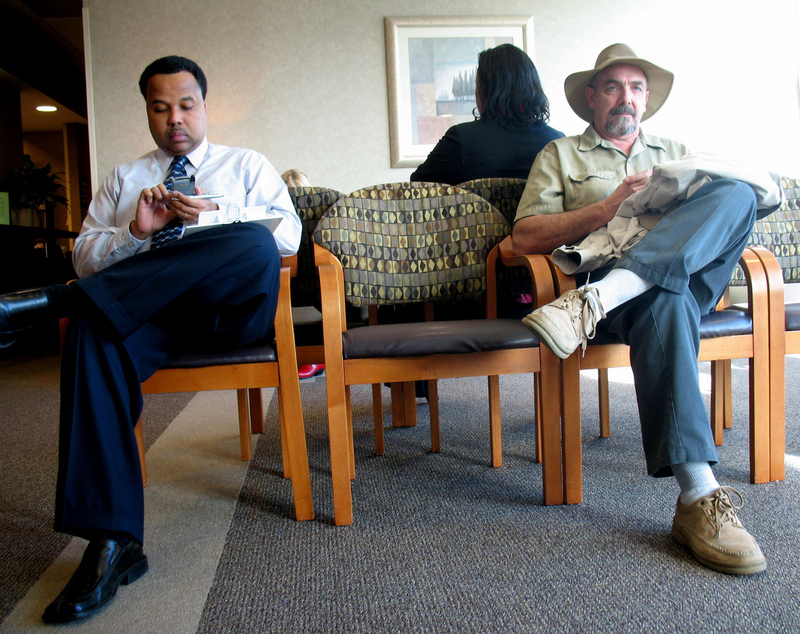 Article / How to Give Your Patients the Best Waiting Room Experience. What if we told you that a waiting room could be an enjoyable experience? Sounds absurd, right? Sitting in the doctor's office is usually on par with waiting in line at the DMV (with the added bonus of breathing in germ-infested air). No one likes to wait at the doctor's office. But guess what? Your practice is not clinical; it's holistic. If you take pride in your practice (and if you're reading this, you probably do), you want to give your patients the best waiting room experience, so they don't start comparing your practice to a doctor's office. Keep reading to find out how to make your patients comfortable from the moment they walk in. Your chiropractic clients are likely experiencing mild to severe pain. Otherwise, they wouldn't be sitting in your waiting room. You should start seeing to their comfort the moment they walk into your clinic. Under your roof, your patients are your number one priority. Helping them feel like you're taking care of their health from the get-go will improve their waiting room experience tremendously. Their treatment will begin before they sit on your adjusting table with the ambience, seating, and waiting room amenities. When it comes to giving your patients a positive chiropractic session, you don't need to spend a fortune to make them feel comfortable. Consider these easy or subtle changes to make in your waiting room. Seating. Understanding that your patients likely have lower back pain or an injury, help them ease their discomfort (if only for a few minutes), by replacing your current chairs with posturepedic seating. Aromatherapy. Gently ease your clients into a state of tranquillity with a calming mist diffuser. Create your own holistic blend of scents to relax your patients or stick with the essentials, like lavender and spearmint. Ambient noise. Whether it's the sound of a table-top water feature, a digital soundtrack of babbling brook sounds, or gentle meditation music, your patients will descend into a state of total relaxation. Refreshments. Offer complimentary beverages, such as ice water, herbal tea, or probiotic drinks. Customers and patients appreciate this value-added service, which gives a comforting element during their waiting period and makes them feel well-taken care of by your staff. It's the subtle things that matter: that's why offering your refreshments in washable mugs?instead of throwaway cups?gives your clinic an eco-friendly reputation. General atmosphere. Take a good, solid look at your waiting room. How relaxed do you feel? Is there paint chipping on the ceiling? Is there a musty smell or a dying plant in the corner? Are all your patient education pamphlets sun bleached from spending months in front of the window? Don't underestimate a general sprucing up. A fresh coat of paint, updated flooring, spotless windows, and new patient literature can go a long way in changing the person's mood. PitStop Messages. Automatically inform patients as soon as they check-in of any upcoming appointments, alerts, or product order notifications. Office Calling System. Encourage a smooth and steady flow of patients by directing them to available adjusting tables using our audio feature and/or digital display. "With the Generation 3 system, our patients are amazed we are completely paperless, very hi-tech, and extremely efficient. They love how the sign-in cards access their files with only the swipe of a card. They also enjoy the availability of their x-rays, postural pictures, and patient file at only the touch of a button. We are regularly having new patients come into the office because they hear that we use the most high-tech and cutting edge technology available in Chiropractic.? "We have been using Atlas for over a year now. Prior to that, my staff spent most of the day pulling files, searching for travel cards and trying to keep up with the paper that exists when there is a traditional paper-based office. The high volumes in our office meant that my staff was constantly under stress. They had less time or energy for patient education/interaction. After a while, I started having a high rate of turnover in my staff due to the demands of a growing office. Atlas has been a blessing.? The demands of your front desk are dictated by your practice's filing system. Paper filing and manual entry can be a time-consuming experience and leaves more room for human error, which also requires time to fix, forcing your staff to spend more time on singular tasks than on helping patients. A paperless office solution, such as Atlas' app-based intake forms, makes patient intake extremely easy, freeing up more time to educate your patients and make them feel welcome. Ready to Give Your Chiropractic Patients the Best Waiting Room Experience? Ensuring your patients are given the VIP treatment from the moment they walk into your clinic requires a combination of comfort, efficiency, and education. You can make your waiting room a relaxing oasis designed to ease their aches and pains, but you must also ensure that their scheduled appointment runs as smoothly as possible and that they are receiving the most up-to-date and essential information. We'll help you get there! Book a free demonstration with Atlas Chiropractic Software, and we'll show you how to instantly improve your practice with a customized solution.